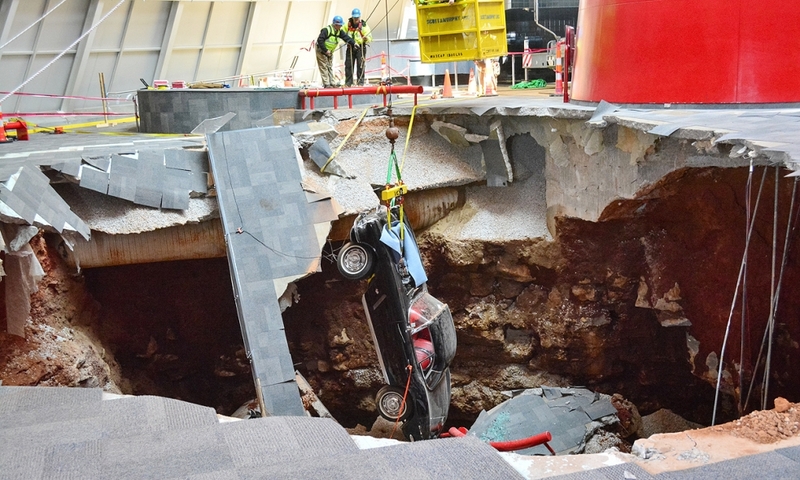 GM on Monday began retrieving eight Chevrolet Corvettes swallowed on Feb. 12 by a sinkhole at the National Corvette Museum in Bowling Green, Ky.
Workers use a crane to extract the 1993 40th Anniversary Chevrolet Corvette from the sinkhole at the National Corvette Museum on March 3, 2014. 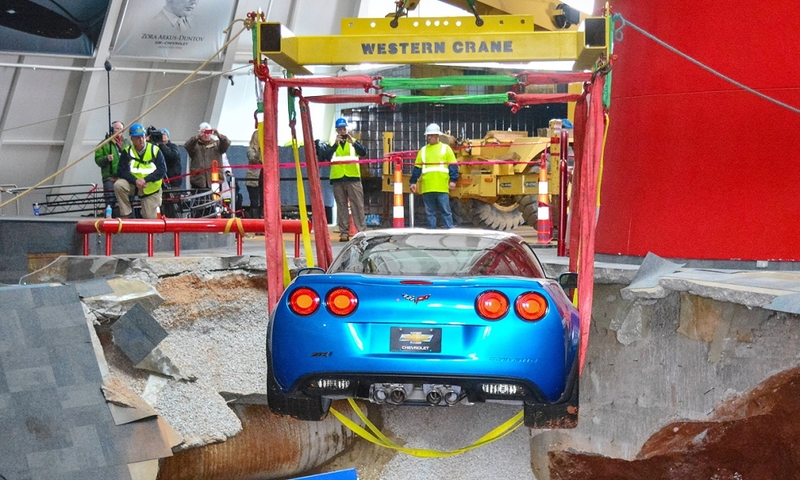 Workers use a crane to recover the first Chevrolet Corvette, the 2009 Corvette ZR-1 "Blue Devil," from the sinkhole at the National Corvette Museum on Monday, March 3, 2014, in Bowling Green, Ky. 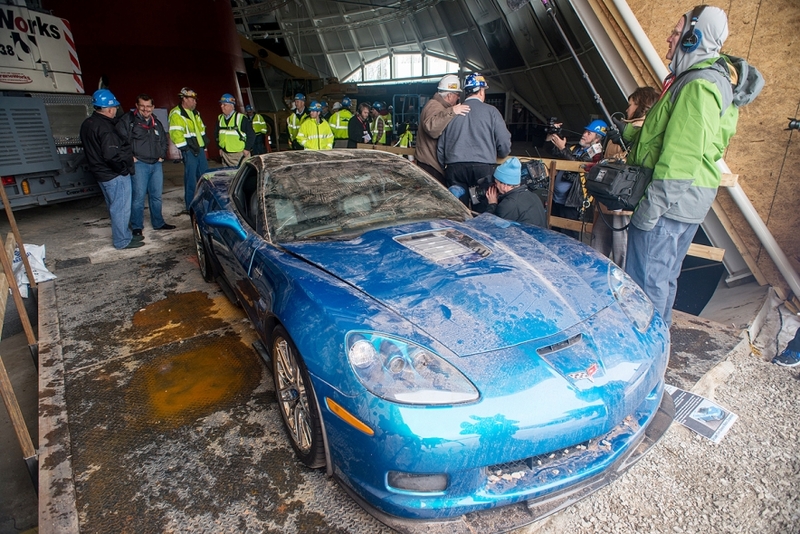 The ZR-1 appears to have sustained minimal damage after its nearly 30-foot fall. 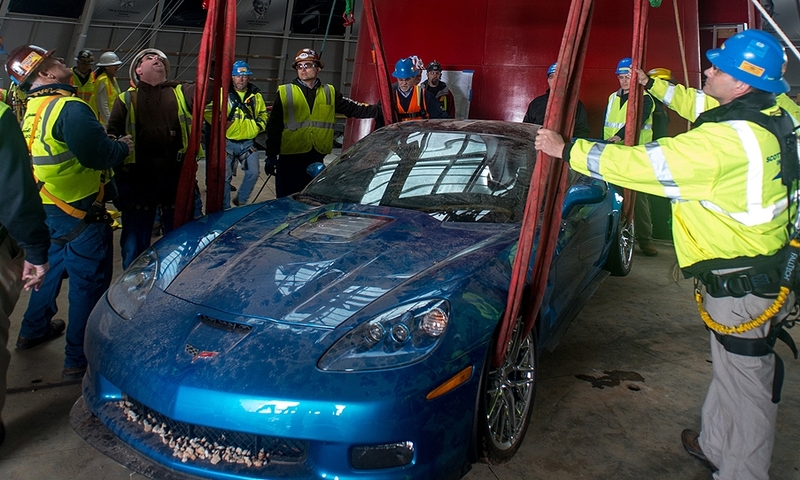 Workers set the 2009 Chevrolet Corvette ZR-1 "Blue Devil" on the ground after using a crane to recover it from the sinkhole at the National Corvette Museum. Representatives from GM design, marketing and engineering who have built show cars will determine the “best way to fix” the damaged cars. 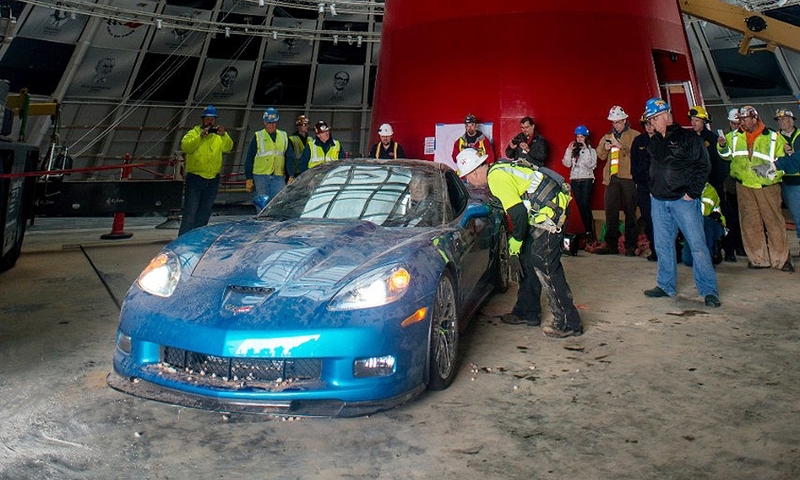 "The 'Blue Devil' is in remarkable shape," said John Spencer, manufacturing integration manager for Corvette. "Cosmetically, the carbon fiber running boards are shattered, there's some minor paint damage, and a small crack in the windshield. Mechanically, the worst damage is a split in the oil-supply line for the 6.2L LS9 V-8. If you fixed that, you could drive the ZR-1 back to Detroit." 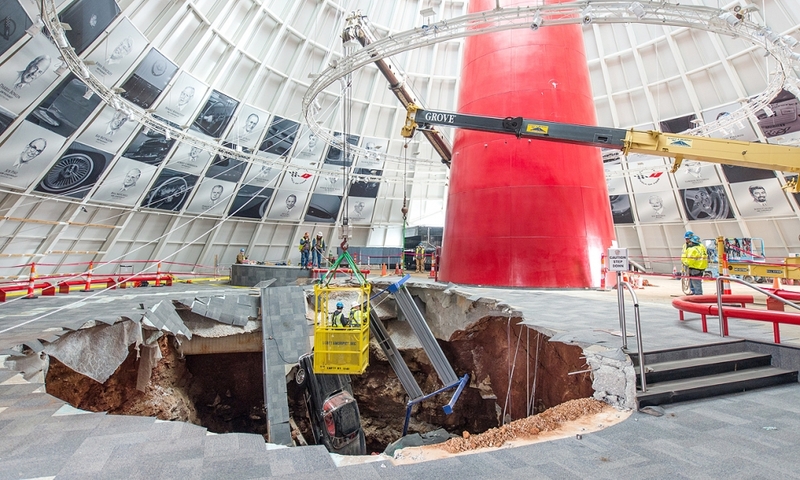 A 1993 40th Anniversary Chevrolet Corvette is lifted from the sinkhole at the National Corvette Museum. 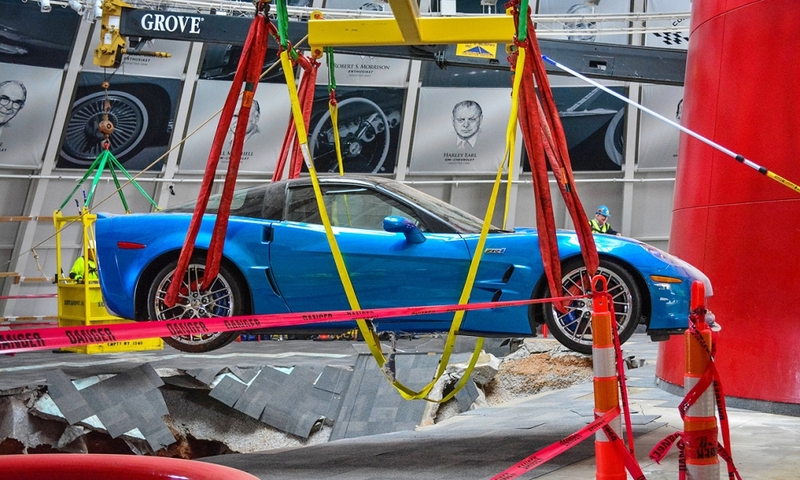 A 1993 40th Anniversary Chevrolet Corvette is unstrapped from the crane that removed it from a sinkhole at the National Corvette Museum on Monday. 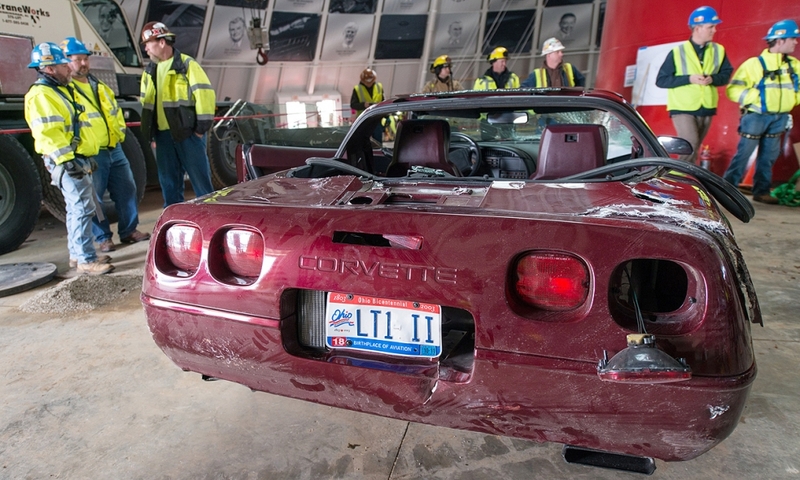 A worker unstraps the 1993 40th Anniversary Chevrolet Corvette from the crane that removed it from the sinkhole at the National Corvette Museum. 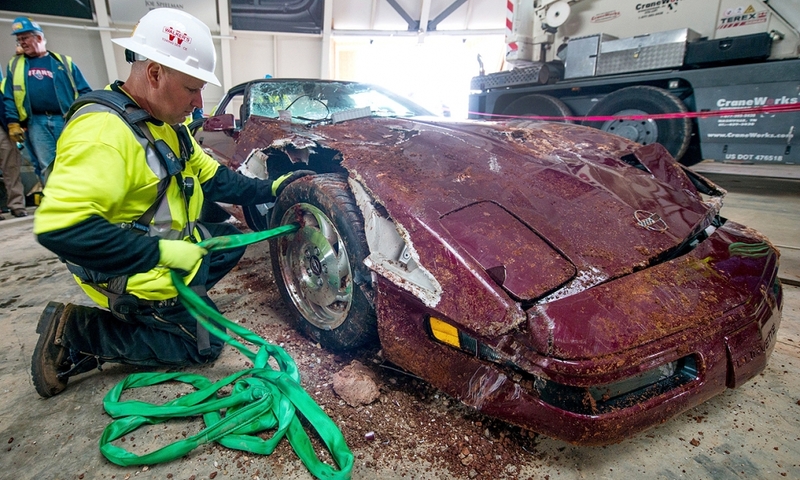 The 40th Anniversary Corvette appears to have sustained major damage after its nearly 30-foot fall. 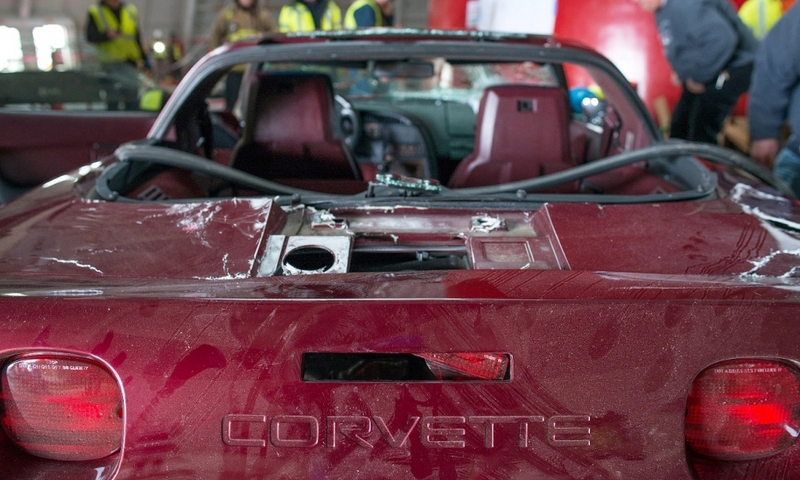 A closer view details the damage to the 40th anniversary Vette. GM says every body panel and piece of glass will need to be replaced. However, based on an early assessment, the frame underneath appears straight, the suspension seems to be intact, and the steering gear still works. 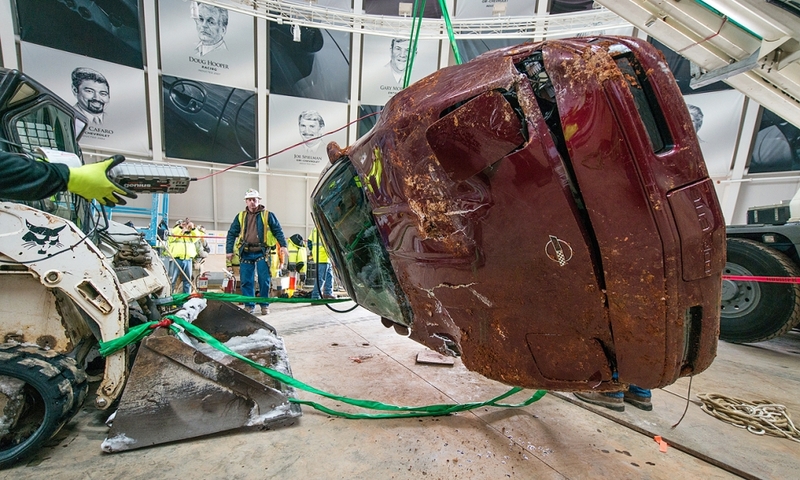 Workers use a crane to remove a vehicle hoist from on top of a black 1962 Chevrolet Corvette. 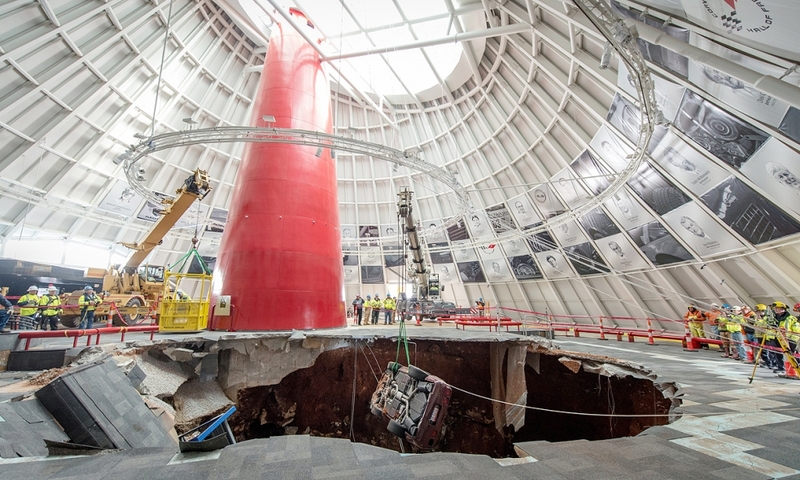 The '62 Vette was removed from the sinkhole on March 4. 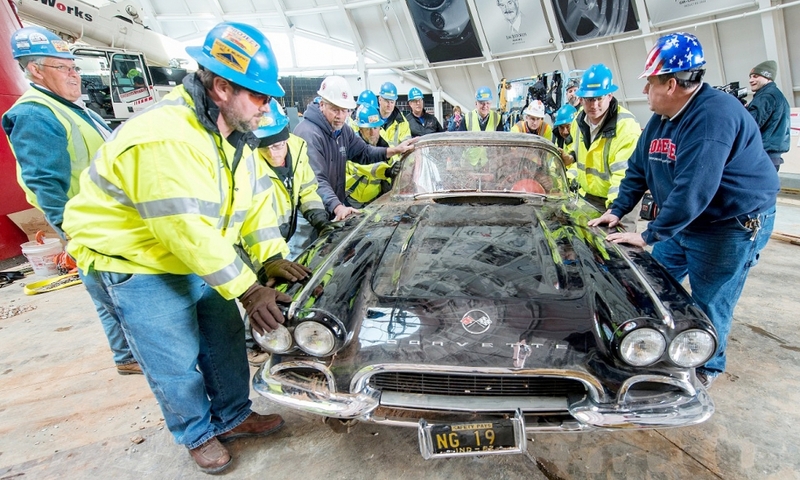 Workers, lowered by a crane, remove the hood of the black '62 Corvette to provide an access point for hooking the vehicle up for removal. 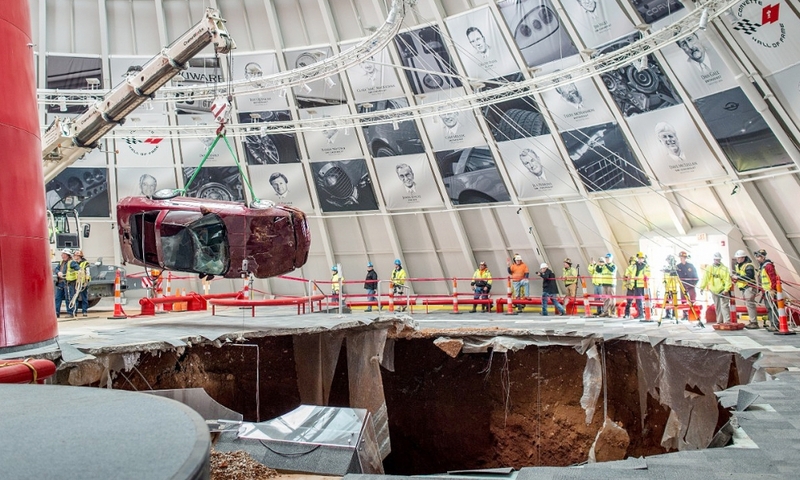 The '62 Vette is removed from the sinkhole. 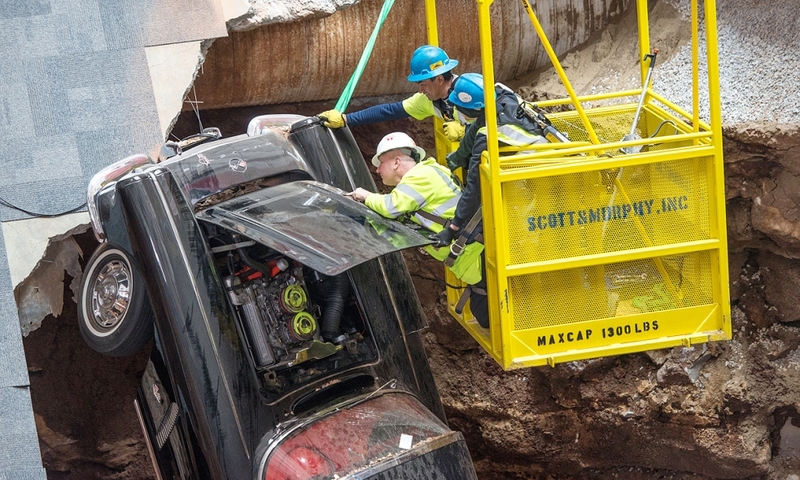 It is the third Corvette to be extracted. 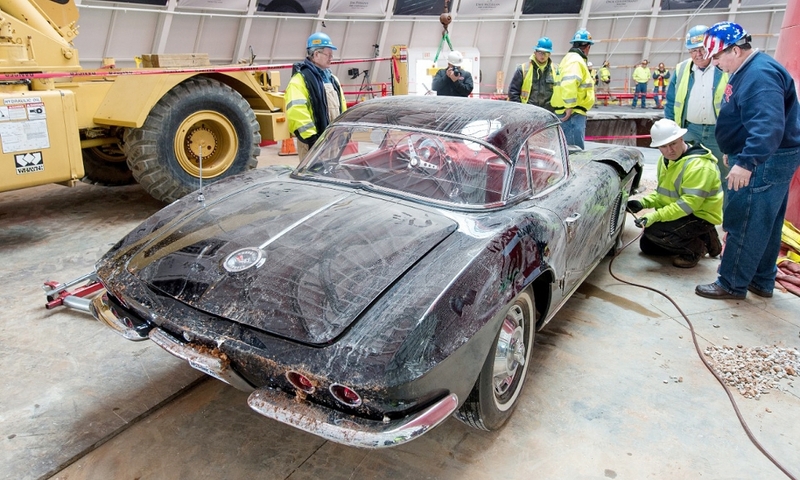 Despite landing tail-down in the debris, the 1962 Corvette sustained minimal damage. GM says the rear end of the '62 'Vette has only a minor crack in the fascia; the bumpers, taillamps, and license plate appear unscathed. The worst damage is an eight-inch split in the right front fender, and golf-ball-size hole where the front fascia was resting against the concrete.